It's that time of year again when one starts to feel a certain sense of renewal and an urgency to cleanse and rebirth as the spring season unfolds. As you go about decluttering your homes, attics, basements, offices and yards, please consider whether your "trash" may be recycled. You know where to take clothes for example. They go to any number of consignment shops, resellers such as VOA and Goodwill, and to neighbors or others who greatly appreciate hand-me-downs (as I do). 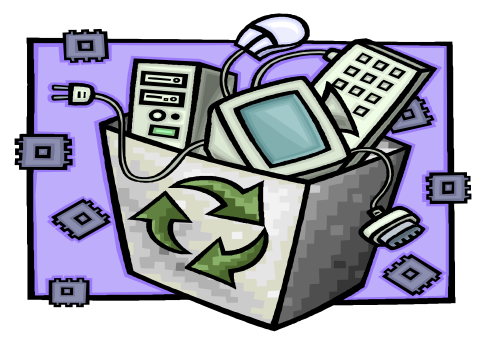 Electronic waste, bicycles, scrap metal, tires and even your broken down microwaves all have a place to go other than our landfills. Please see the attached poster and look at the extensive list of goodies that are being accepted at our next eWaste & More Recycling Event on April 30. There is no charge to drop off anything except for tires off the rim which are $2 or $3 depending on size. New this year is the Rotary ReRuns Sneaker Mobiles which accepts used sneakers (tied together) to send on to those in need elsewhere. Those who drop off eWaste will receive a free bike bottle. 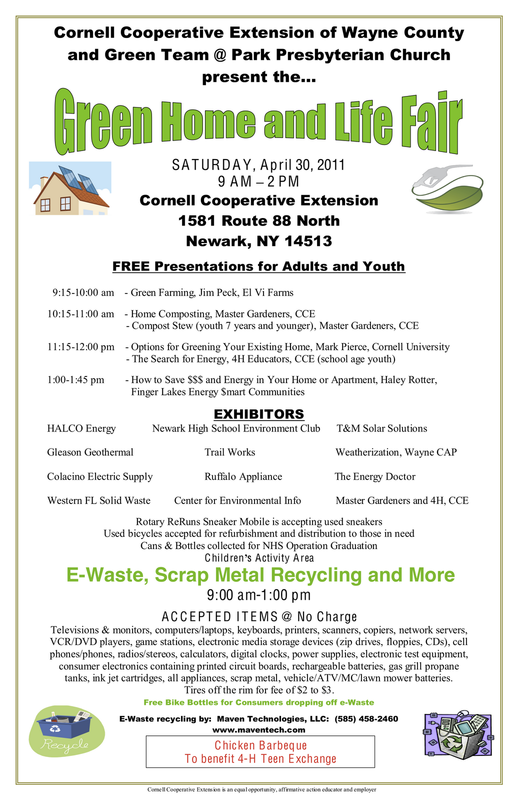 Additionally, in conjunction with this event, Green Team @ Park is working with Cornell Cooperative Extension to host the very family friendly, Green Home & Life Fair. 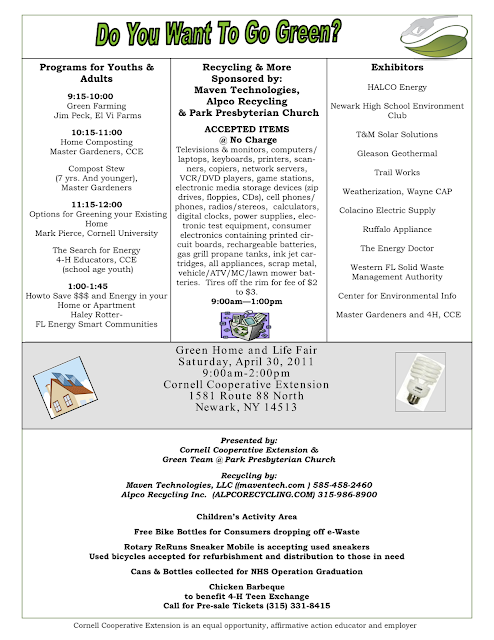 Exhibitors will have information on all things green for your home. Workshops are running all day with two of them especially for youth. A Childrens Activity Area will be open throughout the Fair. Please consider printing, posting and passing the poster on to all your friends, families, neighbors and colleagues. 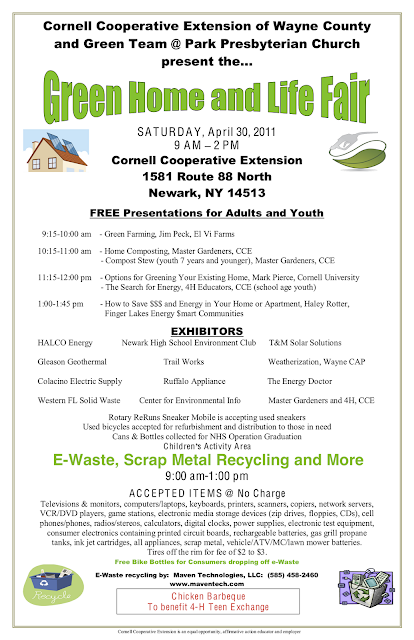 1 Comment to "eWaste and More Recycling Event"
Great to see the electronics recycling finally free of charge. Last year, i paid five bucks to get rid of a monitor. I am definitely going to be there!